This particular entry has nothing to do with Ireland, actually. You see, my father - now 87 and a retired United Airlines Captain - this morning told me a story. It's a keeper and I wanted to share it with you all. Too, I'm fortunate to have a number of friends who are airline pilots and in many ways this is for them. You see, these friends of mine fly those big jetliners made of aluminium metal tubes across the wide oceans to global points of interest. While they really are professionally-trained pilots (honest!) I suspect they spend much of their time on trips playing whist because the aircraft is usually on autopilot and controlled by computers much more powerful than those that steered the Apollo Moon Shots across the vacuum of space. In other words, and unless something goes quite wrong (which very rarely happens) they don't have a whole lot to do. Sixty years ago that wasn't the case. Back in 1953, my father was a budding new co-pilot for the now defunct Resort Airlines. In those days he flew a C-46 (see pic), also a metal tube, that was driven through the air by two large Pratt & Whitney engines which spun a couple of large metal props. The objective of any flight was to reach the final destination by making certain those propellers kept spinning 'round n 'round. Like any aircraft (except for those new-fangled solar powered babies which soar silently through the sky), the C-46 engines were powered by aviation gasoline. This particular aircraft had three fuel tanks: a mid-sized one at the front of the airplane, a smaller one at the rear, and the main tank in the center. Dad tells me that keeping the engines supplied with fuel was a rather critical manual procedure (unless you wanted the engines to stop running): use the forward tank first until it went dry. Then, before the engines stopped spinning, switch to the rear tank until that one went dry. And when both were empty, switch to the final main tank to safely complete the rest of the flight. Switching tanks was a manual task. Each engine had a separate fuel control wheel. So for instance, spin the wheel for the left (port) engine a bit and you'd switch to a new tank. Spin the wheel for the right (starboard) tank in the same manner for a similar result. And both pilots - the captain and the co-pilot - had this same set of fuel controls so each could easily access them. All the pilots had to do was remember which tank was filled with what, and who was responsible for switching which engine when the time came, and it worked just fine. But then there was the trip Dad told me about, flying from Boise Idaho to Kansas City . This was a Cargo flight so no passengers or crew (other than our erstwhile pilots) were on board.The night flight took his C-46 over America's gigantic Rocky Mountains. 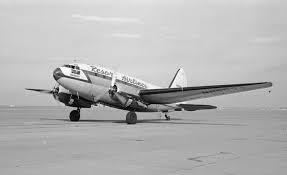 A C-46 wasn't pressurized which meant they couldn't fly above 10,000 feet. So they had to be sorta careful 'cause the mountain peaks weren't too very far below. The engines died again. They had not yet recovered the altitude they'd lost the first time the engines stopped running, and neither could figure out what had happened. What they didn't realize was: when switching tanks the last time, and in all the confusion, they'd managed to switch both engines to the front tank - which, of course, was empty. After much swearing, praying, and wondering just how close a rocky peak might be to the aircraft's underbelly, they finally discovered their mistake. They switched the engines to the full main tank. Both engines caught. The props started spinning around again, and they completed the rest of the flight to Kansas City without another word said between them, thanking their lucky stars all the way. Until today Dad never told me this story. And I don't wonder. If he and his Captain hadn't realized their mistake, I might not be here. And as for my airline pilot buddies: thank God for those little computers is all I can say. At least you can keep on playing whist knowing you'll never have to remember to manually switch tanks.